First-timers beware! Expecting a Christmas feast featuring turkey and trimmings? Get real. 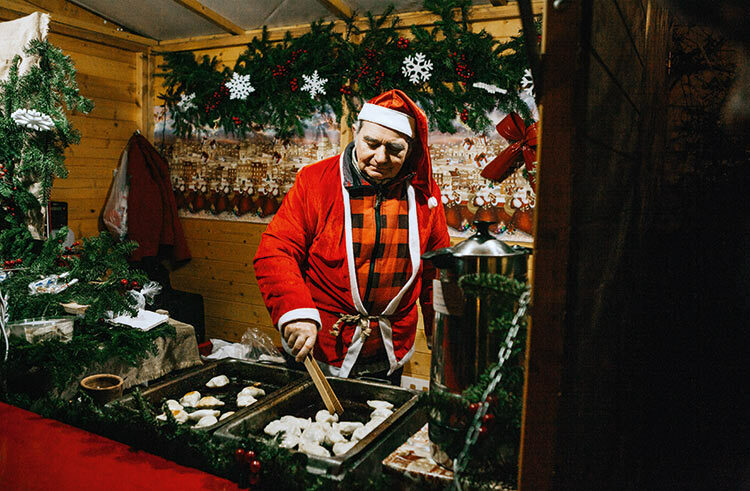 Out in Poland, it’s the carp that’s the king of the traditional festive meal. In the not so distant past, it was common to find the filthy bottom feeder kept alive in a bathtub in the lead up to Xmas (to filter out the mud and slime), before being finished off with a mallet by the head of the house. Good carp is a rare find, but find it you will at the Forteca market. One of the deeper mysteries of Poland is this country’s emotional attachment to the film Home Alone (or, to lend it its Polish title, Kevin W Samu Domu). Traditionally shown on Polsat, when the station pulled it from their schedule in 2010 it was an act so outrageous as to cause headline news. “Polsat Have Killed Christmas,” shouted one irate paper. Forty-six thousand Facebook users agreed, and the company’s executives quickly backed down. When the frost is so sharp that it cuts through your pants, there’s nothing more consoling than a steamy mulled wine. Sweet, sticky and scalding hot, it’s the stuff from the outdoor Christmas markets that really shouts Christmas. For something fixed with a bit more TLC, then try the more upscale food halls of Koszyki and Gwardii, or retreat to a café such as the Old Town’s Same Fusy: the Tolkien-esque setting is special in itself. Plac Europejski’s neon ‘Kocham Warszawe’ sign has become the city’s default selfie spot, and it feels all the more special come Christmas when a small market opens up around. Feel free to clamber on it and pull daft poses with your head through the heart – it’s almost the law to do so. Vying for second spot in the selfie stakes is the ‘I Tree Warsaw’ sign which usually finds itself either at the mouth of Nowy Świat or lurking around up on Krakowskie Przedmieście. Christmas without a tree is like a world without air. Pointless and unsustainable. Fret not, if your early December search has been fruitless then that’s because Poles don’t start buying till around the middle of the month – make your buy from one of the shady entrepreneurs that set up each year on random street corners. God knows where they get their goods, but purchasing from these guys has the illicit thrill of committing a criminal act. Drawing competitors from as far as India and China, Warsaw’s annual ‘Most Beautiful Hen In The World’ competition has long been viewed as one of the greatest kura-osities of Christmas in Poland. Weighing up to seven kilos, anticipate a day of admiring good looking birds with generous chests. Where? When? SGGW uni on the 8th and 9th. Don’t let an unwanted present be the source of despair. Instead, head to Klub Komiedowy (Nowowiejska 1) on December 26th to find a covert basement market in which you’ll be able to trade all the crappy presents you received fromthe in-laws. Starting at 8 p.m., tickets (zł. 25) are best bought in advance. A night of stand-up is also in the pipeline. Despite the relative paw-city of decent pet shops in town, our furry friends are in for a treat this December thanks to an upcoming spate of animal fairs. Top of the bunch is Hala Gwardii with a cat and dog fair to be held on December 8 and 9. Tailing it will be the Łapa Targ dog market in Mysia 3 the following week. Be Santa Paws this Xmas! The Moscow City Ballet will perform Swan Lake on December 14th and The Nutcracker the following day. Tickets will sell out, and could represent one of the wiser investments of the yuletide period – buy them from zł. 149 at eventim.pl. Gaelforce Dance (upwards of zł. 145 from eventim.pl) promise an equally memorable evening. To some, the suggestion of visiting Wilanów is as crazy as going to Mars. But even if you’re one of those who balks at heading to the city limits, make time for the Royal Garden of Light outside Wilanów Palace. Lit by in excess of 300,000 pulsating diodes, lose yourself in a sea of thematic areas whilst tunes by Tchaikovsky and Vivaldi tinkle in the background. It’s beguiling, bewitching and even a little bewildering. For the masses, the National Stadium (zimowynarodowy.pl) will once more become the rink of choice when it comes to winter skating. Transforming itself into a winter wonderland of 5,000 sq/m of ice, features include an ice hill, evening ‘ice discos’, bumper cars and a polar bar for winter warmers. More intimacy is ensured at Pl. Europejski, while the Old Town’s Rynek should again be the spot favored by lovebirds circling the twinkling mermaid statue. On the international front, Warsaw’s gig calendar is strangely dry this December. No problem, get with the locals to singalong to classic acts such as the folk-rock heroes of the Golec uOrkiestra (Tear Roma: 18 Dec), Kayah, a.k.a. the Polish Madonna (PKiN: 9 Dec) or the iconic songstress Ania Dąbrowska (Torwar: 5 Dec). Not cool enough? Then join the post-hipster generation to listen to Lena Romul and the Underground Sound of Slavic Jazz (Hydrozagadka: Dec 9). Expat charity initiatives are numerous in number, though few have gathered steam in much the same way as Smile Warsaw. With the simple aim of feeding the homeless, poor and less fortunate’, this non-religious organization meets outside the Palace of Culture each Sunday to help those on the margins of society. If you can’t join them on the frontline, then clothes and financial donations are always appreciated – check their Facebook for details (fb.com/smilewarsaw.org). 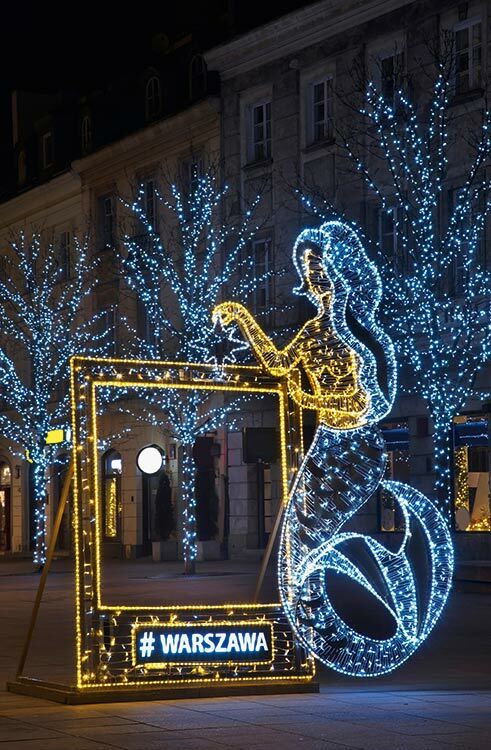 December 8th has been revealed as the date Warsaw will officially flick the switch on its festive lights, with the biggest crowds set to descend on Pl. Zamkowy to watch the button being pushed to illuminate the capital’s tallest tree. Though no time has yet been set, rumors suggest you’ll need to get there by 4 to watch the magic moment. Warning: you will not be alone. Previous ceremonies have drawn audiences that have exceeded tens of thousands. 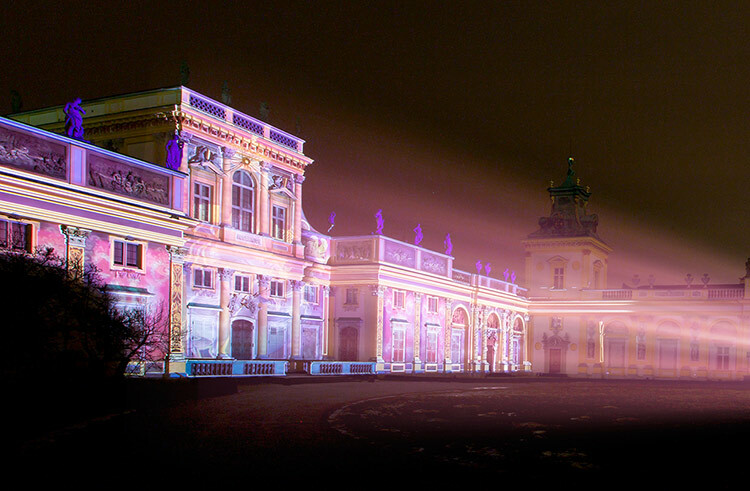 Were they to be laid out one-by-one, Warsaw’s illuminations would stretch to Vienna. Delivered by 60 trucks, and assembled by a crew of 50 workers, over 4.5 million LED lights are set to give the city a big, heavy dose of seasonal sparkle. The Royal Route, running from the Old Town all the way down to Wilanów Palace, promises the best show, though do also check the ‘tunnels of light’ earmarked for Freta and Agrykola. Even if it doesn’t quite compete with the magical Christmas markets of Mitteleuropa, there’s much to recommend about Warsaw’s own effort. Curling around the Old Town walls between the Barbakan and Pl. Zamkowy, it’s here you need to head to browse tacky Xmas merch such as thick-knit jumpers, spooky dolls, country carvings and wooly gloves. Over 60 wooden cabins will be lined up, each selling much the same stuff. Save your visit for when the snow first tumbles. One of the big stories of 2018 was the introduction of a nonsensical partial ban on Sunday trading by the incumbent government. Byzantine in its complexity, it’s not been the calamity most people forecast, but it has been a pain in the neck. In December, expect to find chain stores and shopping centers shut on December 9; private operations, markets, etc. will be allowed to carry on as normal should they so wish. There’s no better time than Christmas to gather friends around a board and spend the night drinking and cheating over complex games that no-one knows the rules to. Nerdy and nutty, the grungy looking Paradox Café dubs itself a Sci-Fi & Fantasy Asylum and has zillions of table-top games to rent from the bar. Forget Monopoly and go for bonkers new wave games with names such as Pandemic, Letters from Whitechapel and Sheriff Of Nottingham. The second the snow begins falling, count on the locals heading to the basement to haul out their sleds and prized toboggans – if you’re desperate, then the nearest breakfast tray will do. Everyone has their favorite hill on which to engage in high speed capers, with the Old Town’s Podzamcze the most traditional hit. In Mokotów, Morskie Oko and Królikarnia are guaranteed to get crowds, as are Wola’s Park Sowiński and Park Moczydło. One of the big seasonal annoyances many foreigners comment on is the seeming shortage of decent Christmas cards to pick from. Hit up one of the big high street retailers and you’ll likely come away with an unwanted sack of religious-themed cards that even the most zealous Catholic would hesitate to send. Fun, cool and quirky, Rzeczownik (rzeczownik.com) are here to save your bacon. Elsewhere, try the pop-up design fairs that will take place around town. On the subject of religion, slip into one of Warsaw’s churches to celebrate midnight mass on the evening of December 24th. Even flinty-hearted atheists and agnostics leave looking thrilled at the pomp and splendor. Highly ceremonial, there’s no better time to appreciate the importance of faith in this staunchly Catholic country. For something more lighthearted, Jewish readers are invited to attend the Chanukah house party hosted by the JCC (fb.com/JCCWarszawa) on December 8th. Urgh: remember when Warsaw went all hipster? Fortunately, there were some pleasing side effects not least the widespread availability of good beer and pulled pork. Of the other miscellaneous fringe benefits, add also the brilliant design fairs held before Xmas. For the most part, find something cool and ‘design-y’ going on most weekends at Dom Towarowy Bracia Jabłkowscy (Bracka 25); furthermore, don’t miss the Slow Weekend on December 8th and 9th nor the Fair of Beautiful Things (Targi Rzeczy Ładnych) at the start of the month. Google them for deets. When you’ve had enough of the crowds, head to lesser-visited corners such as New Town or Mariensztat: both share much the same quaint charm of Old Town, only none of the waves of human traffic. Likewise, the revamped boulevard lining the left side of the Wisła promises a quiet, soothing walk along the icy river. For something a little more escapist, get all Dr. Zhivago by going for a horse-drawn carriage ride around the forests of Kampinos: type kulig kampinos into Google and away you go. Even the most devoted fan of mulled wine will reach a point when enough is enough. 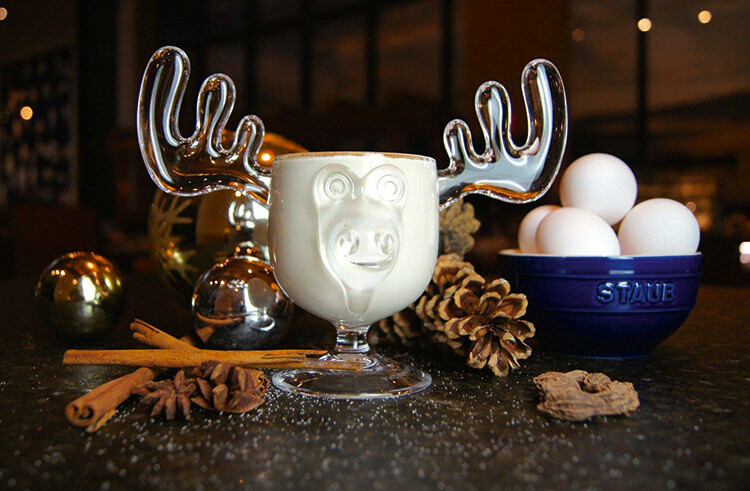 On the drinks front, check into Bar & Books on December 18th to attend a workshop in which you’ll learn how to fix the perfect eggnog (twelve seats only, so book ahead!). After, retire with your creation in front of their fireplace: no other bar in Warsaw feels quite so December.